Salisu Nakande says the Federal Government are to blame for the failure of Nigeria’s first U16 team members to take the careers to the next level. Nakande was a midfielder with that 1985 class that won the 1st FIFA/ Kodak U16 World Cup in China and says it is not a mystery why members of that team did not take their football to the top. “You know after the World Cup and in the excitement of the win we were tagged, “Federal Government Property” and it may have been exciting at first but it later did more harm than good to us,” Nakande said. “We could not travel abroad to sign for clubs because right there at the airports as soon as we are identified from our passports we were arrested and taken back to our clubs since the government had made it illegal for us to leave the country to play football. When reminded that a few like Jonathan Akpoboririe, Nduka Ugbade and Victor Igbinoba were able to take their skills abroad, Nakande said those were just three players out of eighteen. “I tell you it was not easy for us to play football in those days. 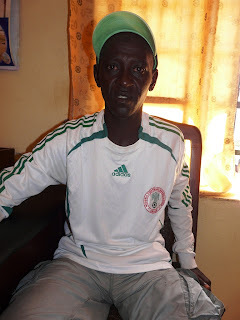 Some of us got frustrated and went to school rather than continue football but I thank God that we were the first Golden Eaglets and we created the awareness that is now there on youth football teams in Nigeria that makes them always want to win,” he told naijafootball247.com. Salisu Nakande now works as a coach/scout with the Plateau State sports council as well as with the Aspire Academy.